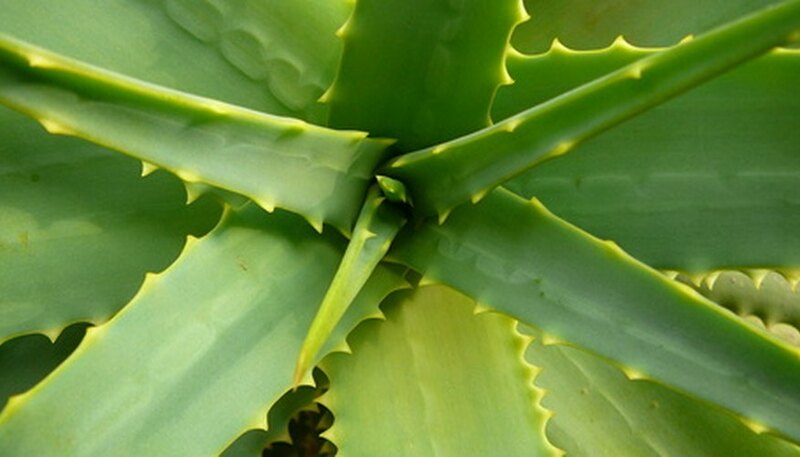 Aloe vera naturally grows in a way that makes it ideal to divide into two plants. Over 250 species of aloe plants exist, with the most common being Aloe barbadensis, also known as aloe vera. Aloe is grown as a houseplant in most of the country because it can really only thrive outdoors in the hottest temperatures. The plant naturally propagates with offshoots, which will become their own, large, aloe plants if planted in their own container. The root system can also hold up to being split into two. Expect new, young aloe plants to grow out of the parent plant. They grow separately at the base of the larger plant. This is how the aloe naturally propagates. The offshoots can sustain their own lives if planted on their own. It's wise to remove them either way because they are taking nutrients from the soil, affecting the rest of the aloe. Remove offshoots when they are a couple of inches tall or larger. Dig into the soil to find where the roots of the offshoots are compared to the roots of the larger plant. Pull them apart to disengage the small plant from the rest of the aloe. Cut through the main aloe plant to separate a large one into two. Use the knife or trowel to cut between leaf stems and get through the root ball. Use your eye to judge where you want to divide the plant--there is no right or wrong way to do it. Keep as much soil intact as possible to protect the roots. Plant the offshoot or divided aloe in a shallow, wide planter. The plant has a spreading root system so the container does not need to be very deep. Improve drainage in the planter if it does not have a drainage hole. Lay down a 1/2-inch layer of gravel at the base of the pot. Put a couple of inches of potting soil on the bottom, then place the new aloe plant on top of it. Fill in around the roots with potting soil. Tamp it down lightly to get rid of air pockets. Water thoroughly. Water divided aloe veras sparingly (1 to 2 cups) in the winter. Because aloe is a succulent, it stores a lot of water and does not need much moisture. In the summer, soak the plant then let the soil dry out completely before adding more water. Feed aloe vera every spring with a food made to encourage blooming. Use it at half strength. The fertilizer should have a nitrogen-phosphorus-potassium ratio of 10-40-10. Wear gloves when separating aloe vera plants. DoItYourself.com: Should You Prune Your Aloe Vera?